Posted on 06/30/2010, 20:12, by martin, under General, Soccer, Sports. Most importantly though, a good model predicts the things we believe in. All over all, I think the model fulfills all good practices of classical statistics. 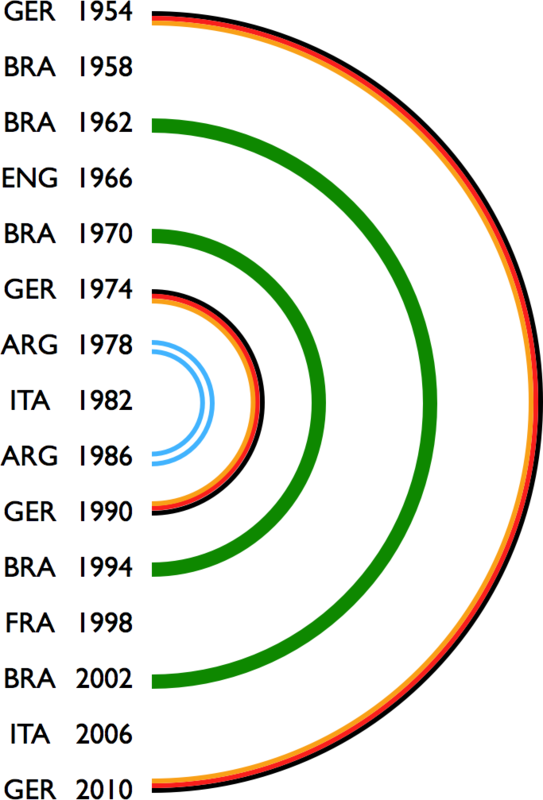 The only thing that makes me think a bit are the team to beat to get to the prediction: Argentina, Spain, Brazil. Anyway, good to have a second “evidence” apart from the octopus. Update: I did this in Apple’s Keynote, as I was to lazy to give protovis a try – anyone more ambitious? what about talent, passion, intelligence and being a team? Then it looks like the US has got some time. Right, 4 out of 15 don’t match, that means that 2 of the 4 need to be changed to get a perfect match, i.e., 2 out of 15 must be counted as errors. So… Uruguay should win the next cup. Argentina? Done! …and forget about Brazil. This is an interesting model. I used the same model to ‘predict’ the next World Cup in Brazil and the winner’s, according to this model, will be Uruguay. The ironic thing is, the 1950 World Cup was hosted in Brazil too. Furthermore, I did the same thing for the 2018 World Cup which will be hosted in either Belgium/Netherlands, England, Russia, Portugal/Spain or United States and the winner of the World Cup in 2018 should be…nobody. There was no World Cup in 1946 because of the war. 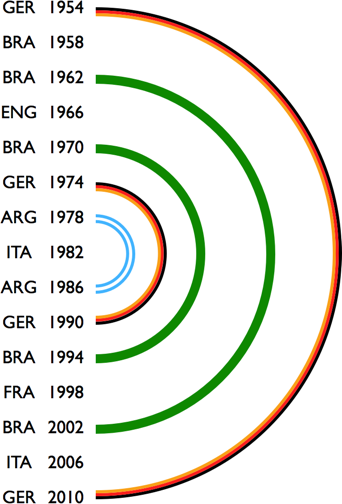 both world cups were won by the organizing country team!! that only leaves Italy’s victory in 2006 out of the model. Does that mean France and England are tighted together? CHARLIE ROSE: And what is the “story of the turkey”? CHARLIE ROSE: Gets fatter and fatter and fatter. NASSIM NICHOLAS TALEB: Fatter and fatter. On the day when its comfort will be at its maximum, there is going to be a surprise. There will be a surprise for the turkey. CHARLIE ROSE: But it’s not a surprise for the butcher, is it? NASSIM NICHOLAS TALEB: Not a surprise for Charlie Rose as well. Not a surprise for humans. It’s a surprise for the turkey. So the whole idea here is we are not to be a turkey. Will there be a turkey in this World Cup? wow – the odds are goood! the model has multiple outcomes and the sample size is less than 30… hence no normal curve.. no poisson and no binomial…. only opition is monte carlo…which is basically random number simulation…. The German’s have what it take to win the 2010 World Cup. Argentina beat, then Spain and then either The Netherlands (likely since they beat Brazil and have not been beaten since the start of the qualification) or Uruguay (less likely now that one of the two star players, Suarez, is suspended). I’m hoping for Ned – Ger, a classic! World Cups from 1930 to 1950 are missing. Why? Because the model doesn’t fit?? All that’s absolutely over-estimated. Numbers and calculations: that’s the sole truth! Did you steal this graph from Goal.com or did they steal it from you? As far as I know, Paul erred on the European Cup finals in 2008 as well and predicted Germany – who lost. Apparently Paul can’t get this right for this particular opponent 😉 Let’s see who will win tonight! Your model implies that after 2010 Germany will not win the world cup ever again, since it has never won the world cup before 1954. Even worse, it implies that there won’t be a world cup after 2034, since the first one was in 1930. On the other hand, it also proves that the world does not end in 2012, which seems to be a good thing in my point of view. A big hug from germany, cause it seems so clear now. its easy to see, that urugay will win the cup next year. England and France are no multiple winners. In fact, according to model the they can never win again. Well, we all knew that from England and seeing the French playing this time…. sounds accurate to me, too. martin, im sorry but 1930 + 1950 does not add up 3964. there is no pattern, this is just made up statistics to suit your own whim. alex, ever considered this to be big fun and not statistics ? perfect! Thanks for the hint, that at least gives the model some accuracy ;-).